I met Bobbie, the boatman, at 8:00 a.m. Just as last evening, I got into the boat and Bobbie moved the boat a few meters away from the dock. He stopped his engine and poured me a cup of rakija. Bobbie says that in the morning rakija gets the blood flowing and the heart beating. 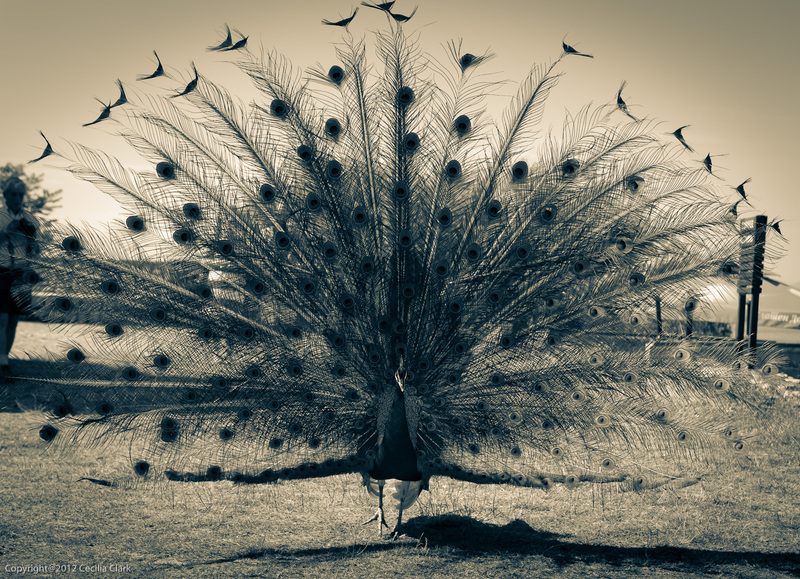 He says it is better for your heart than running 3 kilometers each day. With a rakija for each of us, we set off again toward St. Jovan of Kaneo. Another stop was made for the preparation of Turkish coffee, and then we were off again. More rakija was offered and declined. 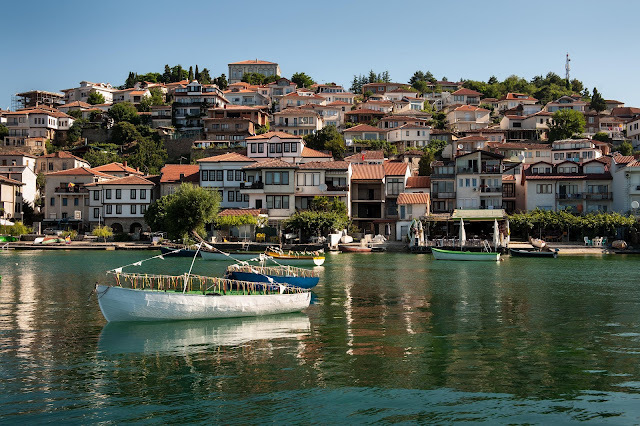 The old city of Ohrid is even more beautiful in the morning from the water. It is quiet and calm and most people are still sleeping. After St. Jovan of Kaneo, we traveled in Bobbie's boat toward Tito's former residence. There wasn't much to photograph, but the residence sits on a hill above the lake and it is nestled in a forest of large trees. A new presidential residence sits nearby. Presidents really know how to live. 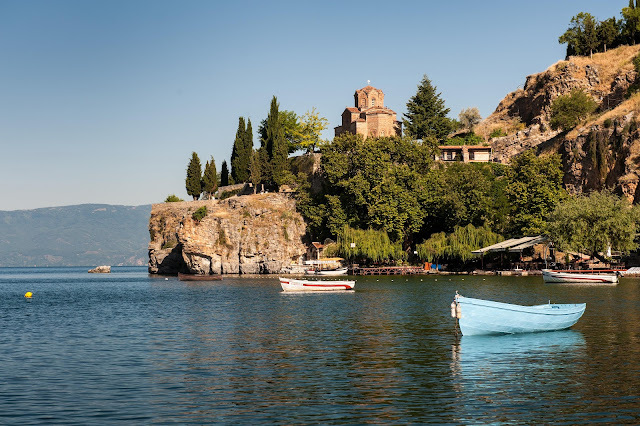 The boat trip lasted about 1-1/2 hours and was a very good way to begin a summer day in Ohrid. I checked out of our room and picked up Dan about 2:00 pm. We drove about 27 kilometers farther west to visit Sveti (Saint) Naum Monastery. This monastery sits very close to the border with Albania. Approximately 30% of Lake Ohrid is in Albania. 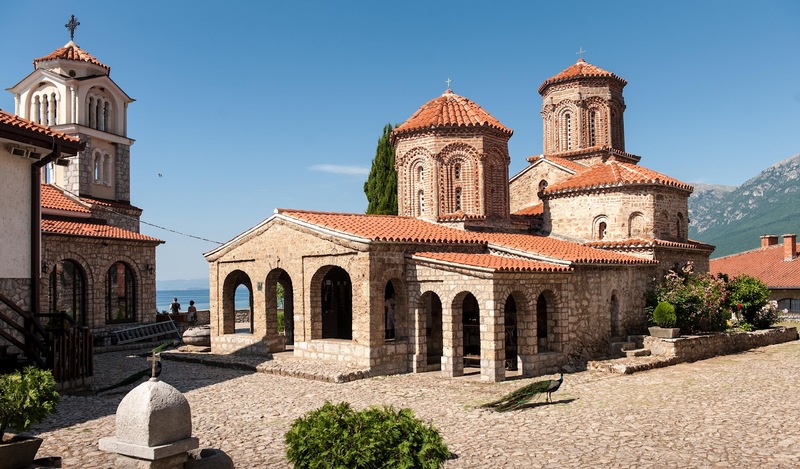 Sveti Naum is in a lovely location above Lake Ohrid. The current structure was built in the 16th century on much older foundations. Free-range peacocks stroll the grounds and sit on the church rooftops. After our brief sightseeing detour, it was time to drive back to Skopje. When we arrived in Skopje, we decided that we'd make it easier on ourselves and park the rental car in a nearby parking space to empty it of our luggage and accumulation. About 20 minutes later, we returned to the car to drive it back to the rental car agency--the car had been booted. We've never parked a car in Skopje so did not realize that the parking space was in a pay lot and that even at 9:30 p.m., there was a parking fee. We called the phone number on the sticker on our window but no one spoke English. Dan called his co-worker who called the city parking department for us. She told us someone would be there in about 15 minutes. The parking guy showed up within 5 minutes on a Skopje City Rent-a-Bicycle. Dan paid him 1,100 MKD (about $22 US), and he removed the boot. He was tough and said ignorance of the law/rules/sign was no excuse. We appreciated his efficiency. If he worked in the ministries responsible for our Visas, we'd have them by now. Last week Dan got his permit to legally work in Macedonia, but at this point he is (we are) still illegally residing here. He's still following the myriad steps necessary to get our resident Visas.